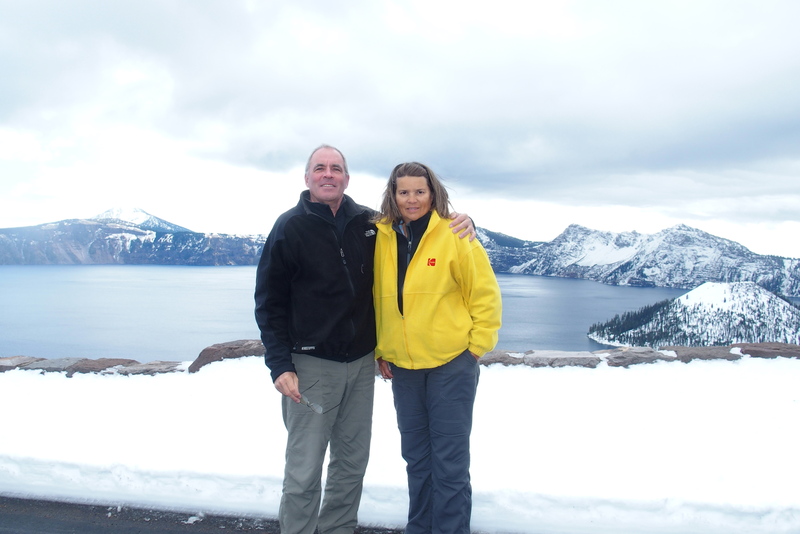 Here we are at Crater Lake in Oregon. Notice the snow on the ground. It’s cold! 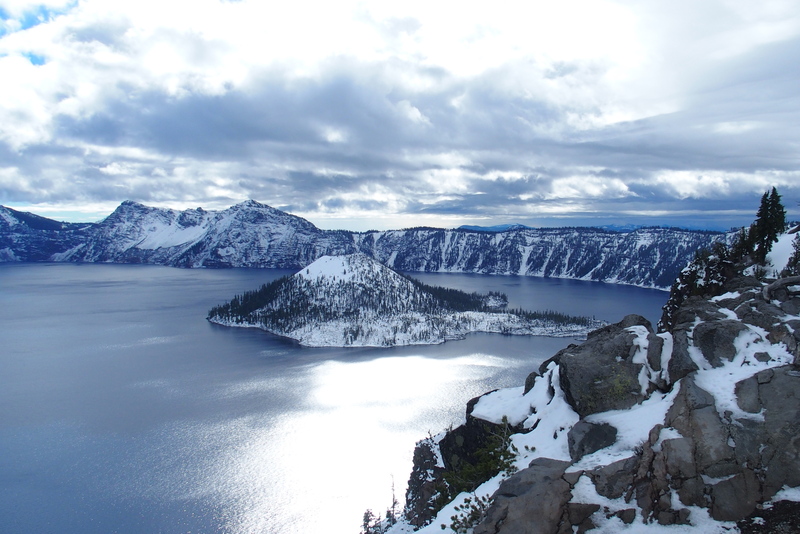 Snow and volcanoes don’t seem to go together, but this park has both. There are more than 40 volcanic cones here! The one that erupted most recently (4,800 years ago) is hidden under the lake. The area remains thermally active, but you’d never know it with the cold and snow we’re experiencing. Wondering if there is a view beyond the snow drift. There is! 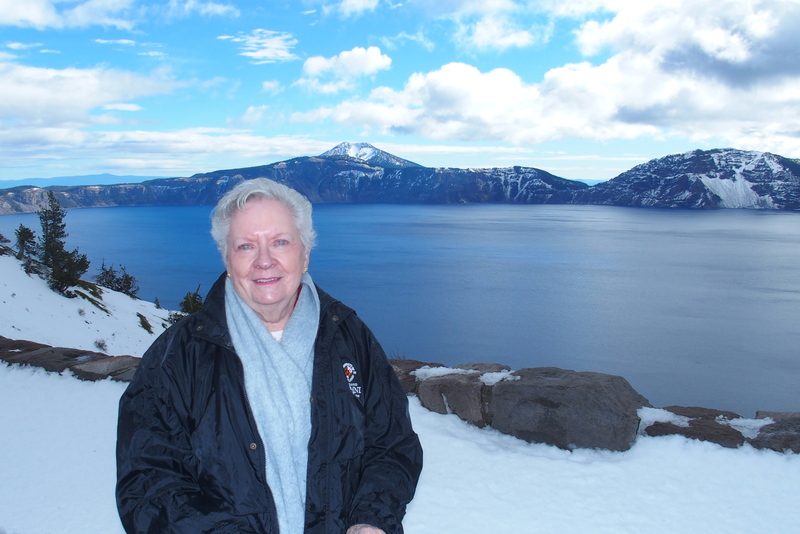 We have found Crater Lake. Mount Mazama was a volcano here not quite 8,000 years ago. After the volcano erupted (quite violently!) it collapsed, forming an almost perfectly round caldera or crater. 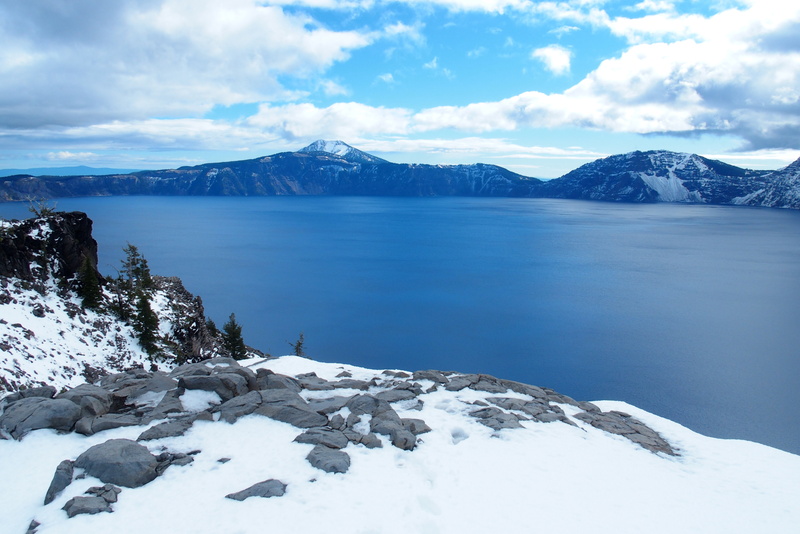 This filled in with snow and rain to create Crater Lake, nearly 2,000 feet deep. On a blue-sky day, the lake deserves its frequent nickname of Blue Lake, but today we saw its alter ego, Shiny Gray Lake in the Clouds. We did have a few moments of clear skies to begin to appreciate the blueness of this vast lake. It’s almost 2,000 feet deep and about 6 miles wide. Crystal clear, very deep water means blue light is not absorbed, so we get the very blue lake. The island at the edge of the lake is Wizard Island, a volcanic cone that formed after the major eruption and collapse. Twenty-five years ago, scientists explored the depths in a manned submarine (brought to the location by helicopter) and found blue pools in the crusty underwater surface and elevated temperatures in certain spots. It is another area, like Yellowstone, that could become active again on the surface during our lifetimes…but not on this trip. Worth the trip? Marcia says yes! 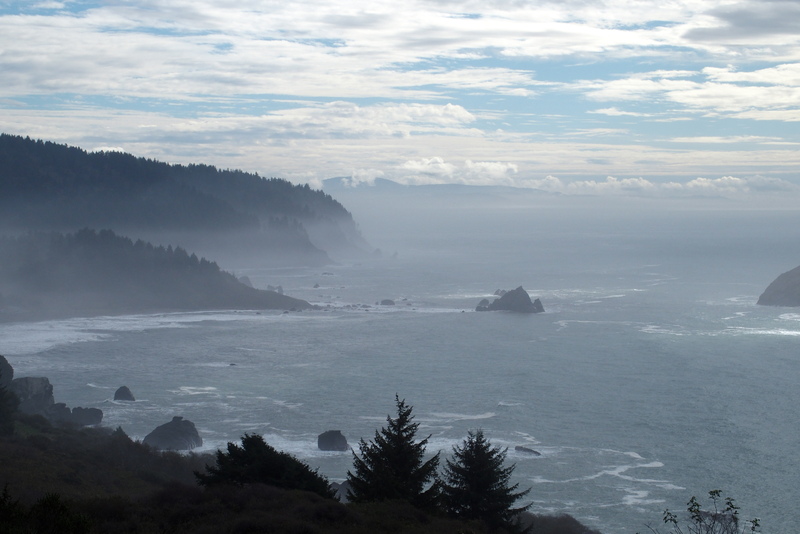 We drove south and found more wild coastline, this time in California. Saturday’s storm really ravaged this area. We drove above a cloudy mist for much of the day. The one on the right looks like the poster boy on the public service ad with the caption “Don’t club baby seals.” He survived, thankfully. Getting onto this float is not an easy task. 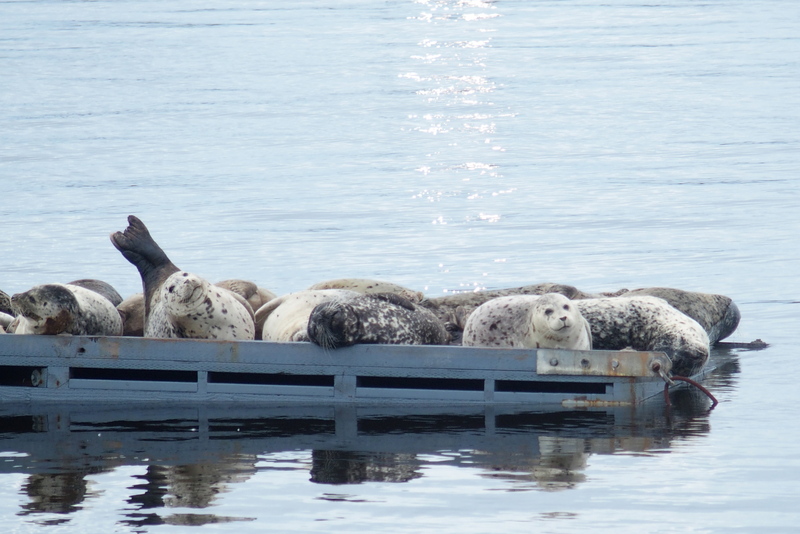 First, the seal bobs several times in the water looking for an open spot to squeeze in. (His buddies don’t say “Come on up” and slide over to make room.) Then he pushes his head over the edge of the raft, tucks his chin down for leverage, reaches the tiny flippers onto the wood surface, and pulls the remainder of his 200 pounds out of the water. With a lot of shimmying and tail-flapping, he’s aboard. And he probably stays there all day. 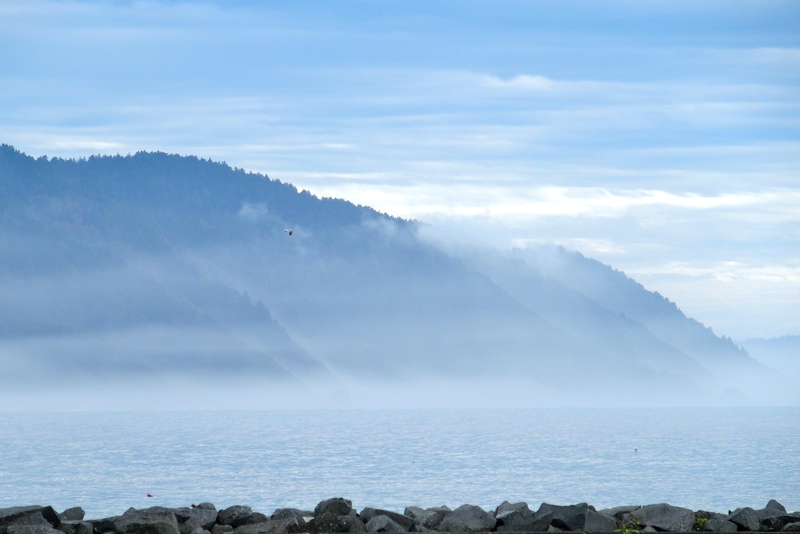 This shoreline at Crescent City looks a little like the bluff at Keuka Lake. While we watched the seals at the harbor, workers were busy cleaning up the pier and parking lot. This was Thursday and they were still removing huge logs and dozing away large rocks, gravel and kelp. However, these after-effects were nothing compared to 50 years ago when the Alaskan earthquake triggered a tsunami with a 21-foot wave that overwhelmed Crescent City, killing at least 12 people. Tsunami preparedness signs are everywhere. 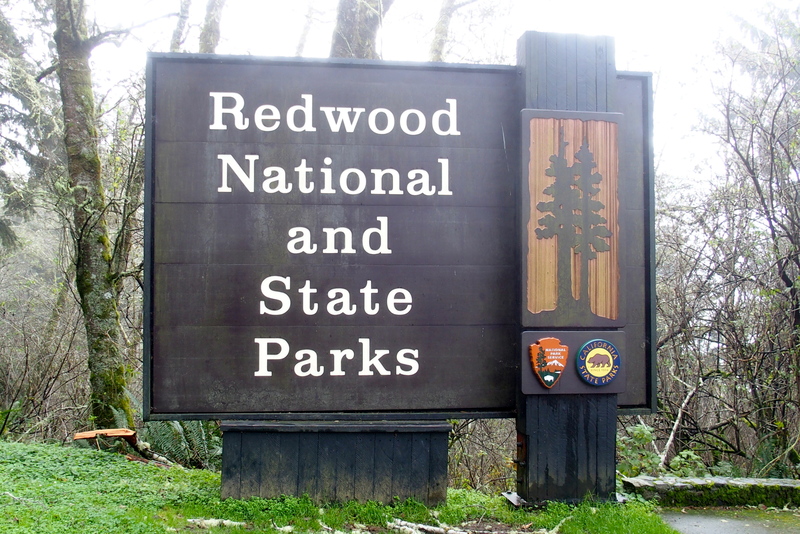 We kept driving south and found ourselves in another national park, Redwood. 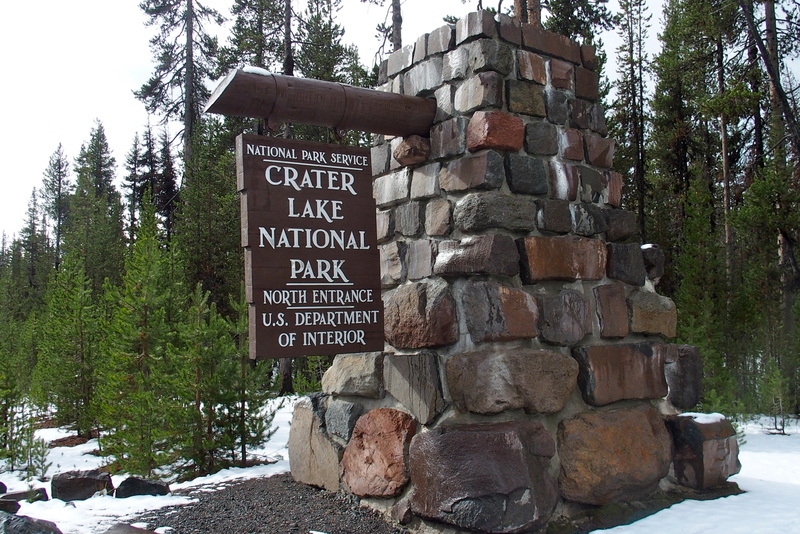 It actually stretches over 330,000 acres of land managed cooperatively by federal and state agencies. 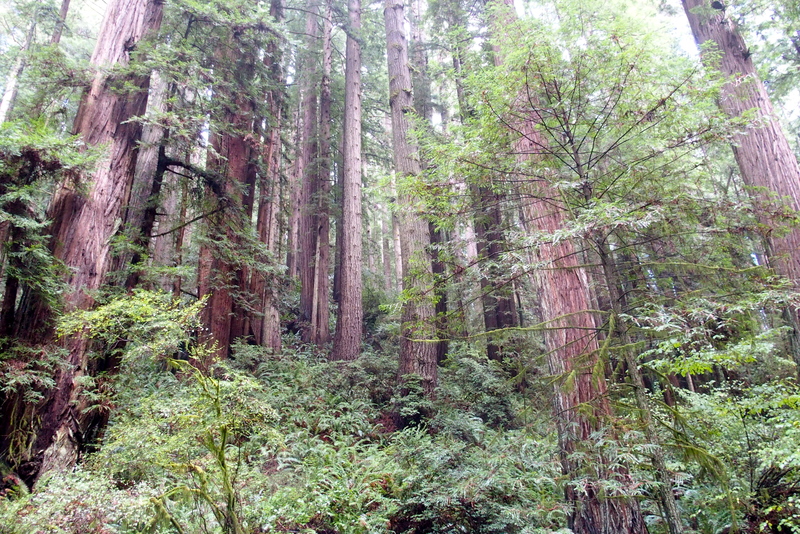 The shared goal is to preserve the towering redwoods. California State Parks celebrates 150 years of existence this year (a happier anniversary than the tsunami). 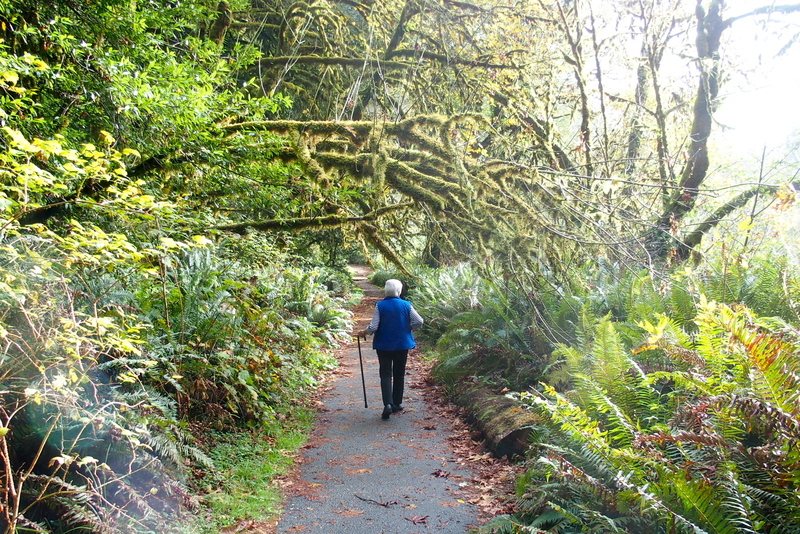 The park stretches for miles along the coast. The trees are too big to photograph in one frame! Majestic redwoods, straight, tall, creating such a dense forest we can’t see the sky. 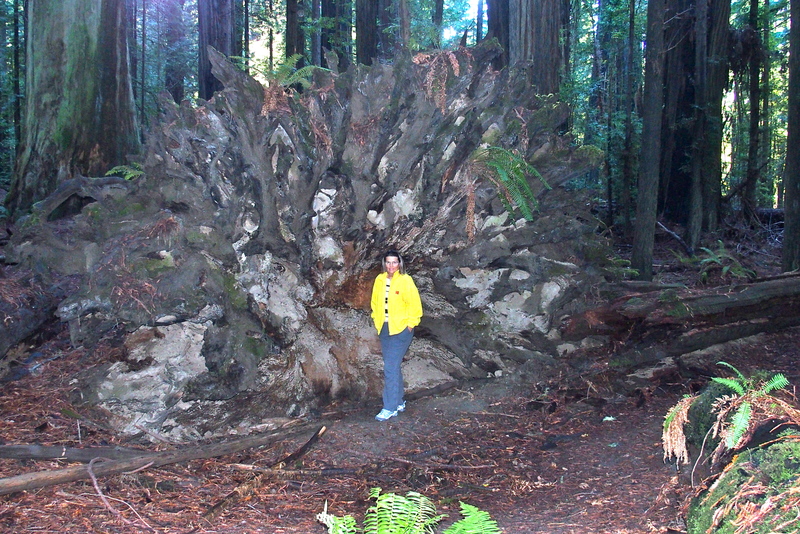 One specific redwood has a name: Big Tree. 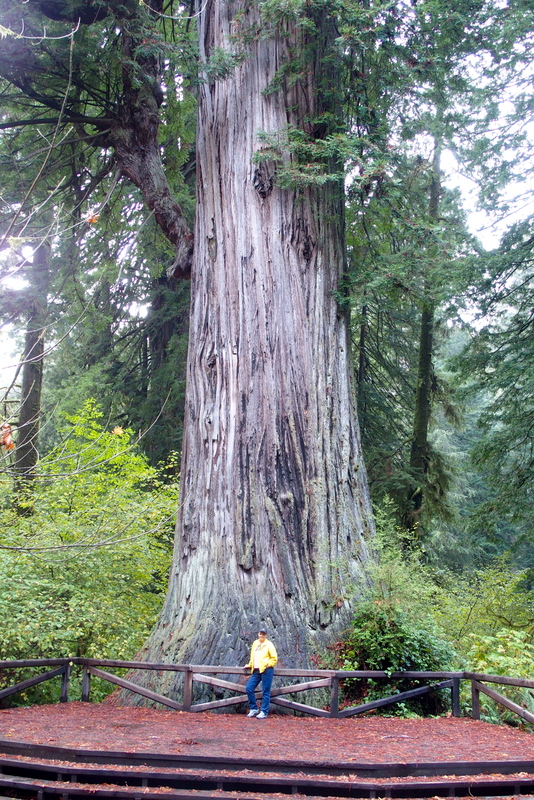 It’s 304 feet tall, 21 feet in diameter, 68 feet in circumference, and probably about 1,500 years old. At one time, an enterprising businessman in the area wanted to cut it down and make a dance floor on the stump. Fortunately he didn’t, so we have this sight to enjoy. Better a tree than a dance floor! Leaving the Big Tree, totally awed. Many acres have been harvested in past years before conservationists succeeded in their preservation efforts. That means giant tree trunks are left behind. This might be the secret kitchen of the Keebler elves: a hollow tree trunk, big enough for a giant oven. And the answer to the question, “If a tree fell in the forest and no one was there to hear it fall, would it still make a noise?” seems pretty obvious. This tree made a giant crash. The sheer mass of the tree and its roots is so great it’s hard to imagine a more powerful force that could cause it to fall. 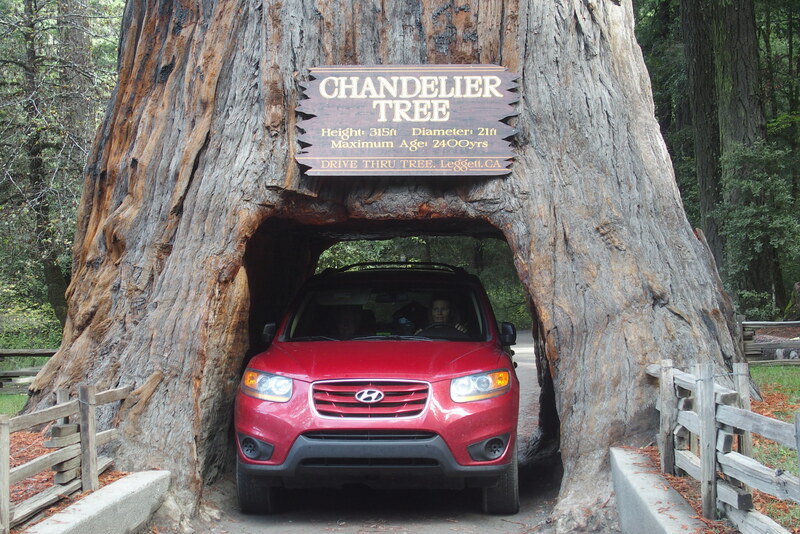 One obligatory sidetrip was to “the tree you can drive a car through.” This one is estimated at up to 2,400 years old. We tucked our side mirrors in and glided through with ease. A bigger SUV inched through behind us, barely avoiding scraping the sides or getting wedged in place. How would AAA react to an emergency call to be removed from a tree? How many thousands of cars have passed through this tree? Yet it still stands strong and tall, 300 feet tall. No national park visit would be complete without wildlife. 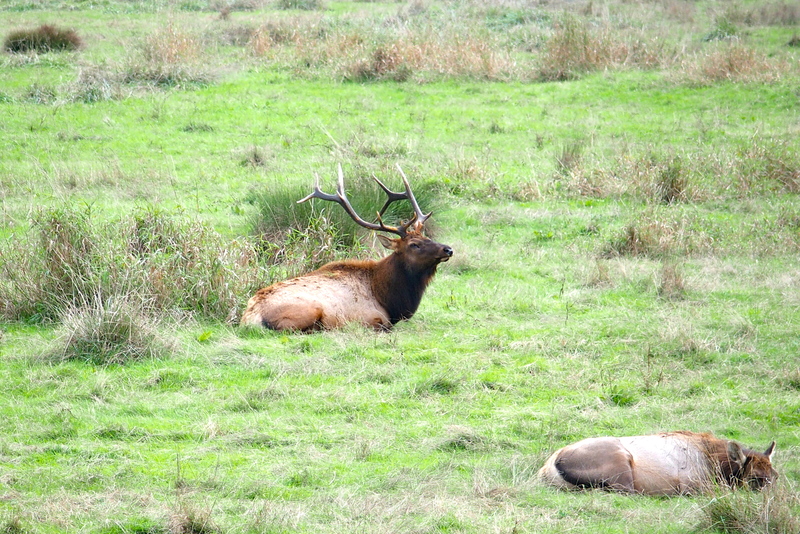 We stumbled across a mighty elk and a harem of 30 or so lady elk. A lazy day today: They were all chewing their cud in synchronized motion. We ended the day as we started, driving along California shoreline. 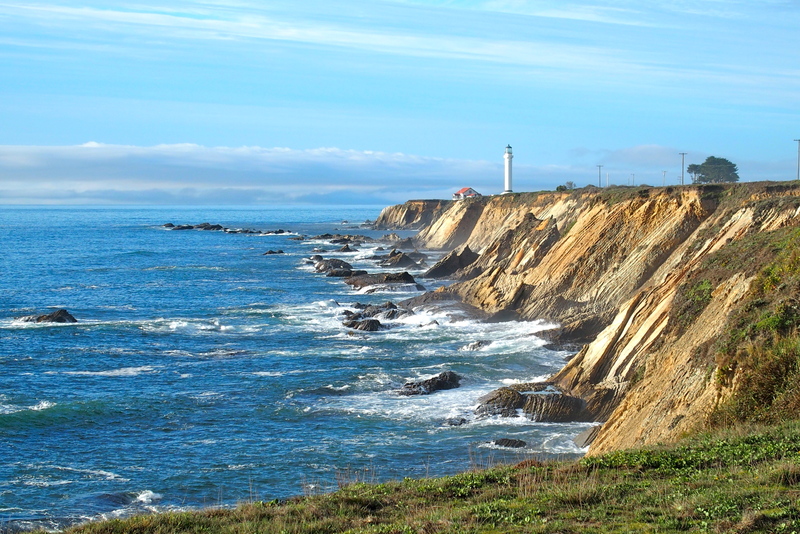 Point Arena Lighthouse and the rugged shoreline. 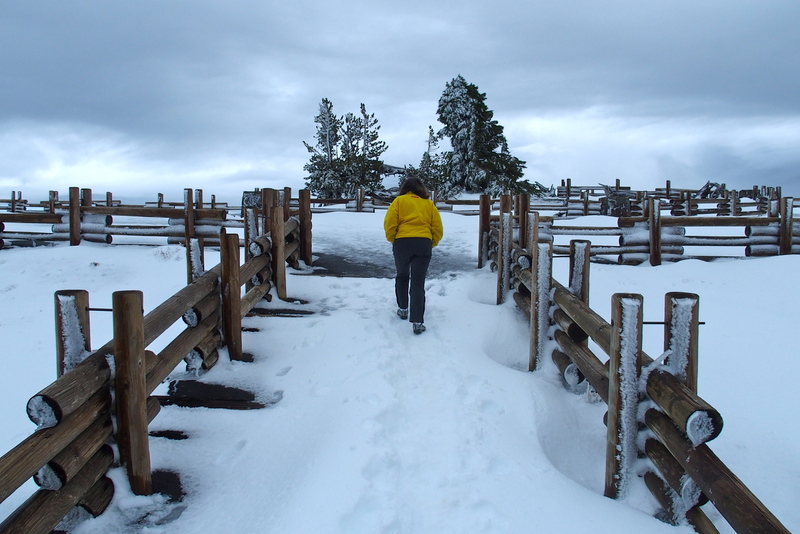 This entry was posted in Travel Journal and tagged California, Crater Lake, elk, national park, Oregon, Redwood National Park, snow, volcano. Bookmark the permalink.